Can someone please point me in the direction of the problem? Why exactly do we feel this picture is sexually motivated in ANY way? Why does the social media community have to take something so positive, and sexualize it in such a way as to make it negative? As usual, social media got ahold of this photo, and wasted no time in pushing THEIR agenda, saying that he was pushing some kind of homosexual agenda, people questioned why he even took the picture in this way in the first place…like, y’all are making a big deal about HAND PLACEMENT! Come on! #DoBetter. These days, African Americans are being mistreated, disrespected, killed, beaten, overlooked, snubbed, jilted, left behind, etc. by the majority. In this picture, I see 2 good-looking, hardworking African American men who are breaking barriers and striving to be the very best at their professions; and instead of going their separate ways and trying to seek out White directors, or White actors, they stand TOGETHER, and break the mold TOGETHER. They are striving towards changing the narrative of a “White Hollywood” industry TOGETHER! I mean, who wouldn’t want to see a young Black actor and a young Black director photographed together, showing the world that they have an equal love for each other as brothers, and as professionals in their respective crafts. So why are we sitting here, trying to demean this picture and make it something it isn’t?? Not to mention, with everything else going on in the world, do we really have time to criticize a picture, when we could be arguing and expending energy on more important agendas, rather than picking apart a picture trying to make something out of nothing, WHEN THERE IS NOTHING REALLY TO PICK APART? When the photo was posted a week ago, I saw it, and frankly thought nothing negative about the photo. I took it for what the caption said, “My Brother in Arms.” They are fighting a tough battle right now, and he sees this man as a brother, a friend and an equally talented professional. Someone tell me why this is wrong, because I can look at this picture 1,000 times, and still see nothing “sexual” or “wrong” about it. And furthermore, if for some reason it was a picture of 2 men in a romantic relationship, who cares?! Oh, I forgot, we have an issue with homosexuality as well *rolls eyes*. Let me know your thoughts on the photo. 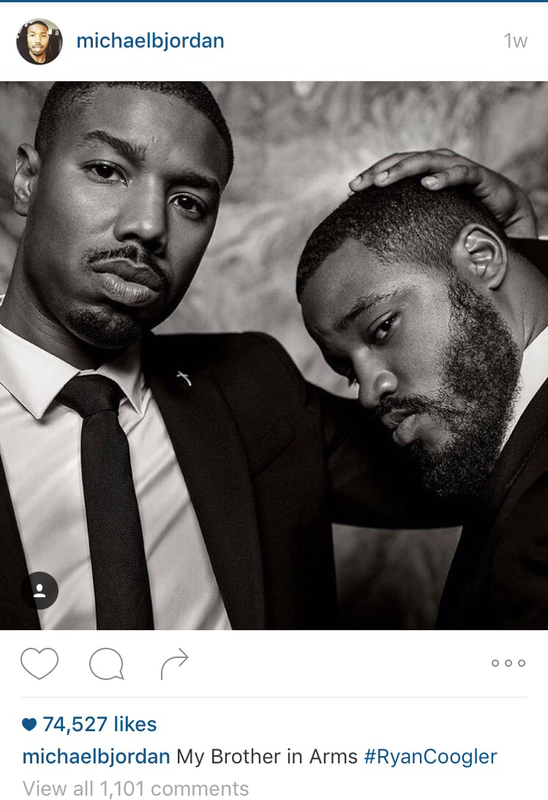 Posted in WritingTagged actor, brother, controversy, director, Hollywood, homosexuality, industry, instagram, Michael B Jordan, negative, photo, Ryan Coogler, social media, Whit C.